It’s that time again. Google has decided to kill off yet another one of its services. This time, it’s Alfred, a handy local recommendations app that will shut down July 19. 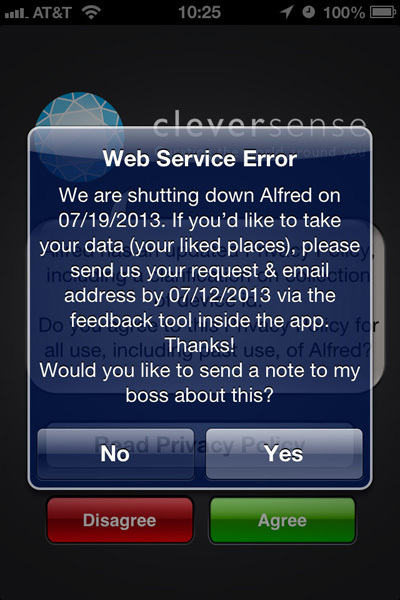 Google purchased mobile application maker Clever Sense, the creator of Alfred, back in December 2011. At that time, the Clever Sense team joined Google’s local services division. No doubt those same folks have likely been trying to make Google+ Local better while Alfred was gathering dust. The last time the app got an update was May 24, 2012. Google did not issue a blog post about the shutdown like it did for its Reader or Latitude services, but instead posted a notification inside the Alfred app that it would be shutting down in a week. Users of the Alfred app who would like a copy of their data have to issue a request inside the app by the end of today. The Alfred shutdown should not be terribly surprisingly to those paying attention. Other apps Google has purchased and subsequently shut down include Meebo, Wavii, Jaiku, Slide, and Aardvark. What’s perhaps more surprising is that Google let Alfred sit in the iTunes App Store for more than a year without a single update rather than just letting the thing die a dignified death.